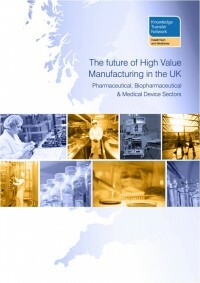 This report follows on from a study into the future of High Value Manufacturing (HVM), in the UK commissioned by the Technology Strategy Board and published in February 2012 (Technology Strategy Board ‘A landscape for the future of high value manufacturing in the UK’ February 2012). This report was prepared on behalf of the Technology Strategy Board by the Health KTN and IfM Education and Consultancy Services, Institute for Manufacturing. The editors of the report are Sue Dunkerton, Co-Director and Dr Mark Bustard, Technical Director, Medical Biotechnology of the Health KTN. This report presents the findings from studies of the pharmaceutical, biopharmaceutical and medical devices (including diagnostics) sectors (The terms pharmaceutical and biopharmaceutical are used in this report to describe chemical entity manufacture and biologics manufacture respectively. Workshops were held for each sector attended by representatives from industry, government bodies and the research community. Strategic roadmapping techniques were used to help participants explore each sector’s key trends and drivers; the novel products, processes and services which could be developed in the future; any technologies and capabilities required to support these opportunities; and the enabling factors that would help the sector respond successfully. The list of potential new products, processes and services was prioritised to identify key areas where it was thought the most valuable opportunities for innovation exist. A Case for Action was developed to justify further work in each area, outlining the potential benefits, critical gaps and steps required. This report covers those sectors within Life Sciences which impact on human healthcare, addressing specific manufacturing requirements for each of pharmaceutical, biopharmaceutical and medical devices as well as examining where synergies across all three sectors exist.